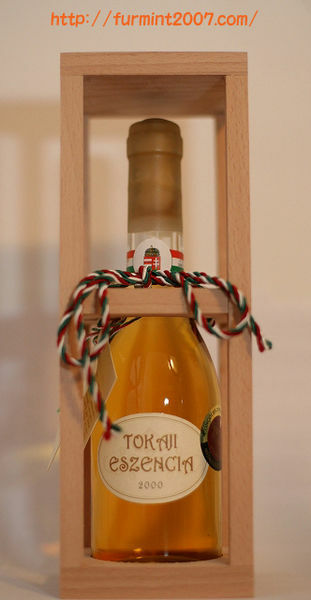 Tokaji is the name of the wines from the region of Tokaj-Hegyalja in Hungary. The name Tokaji (which is of Protected Designation of Origin) is used for labeling wines from this wine district. This region is noted for its sweet wines made from grapes affected by noble rot, a style of wine which has a long history in this region. Since 2007, only authorised wine producers from the region are able to use the Tokaj brand name. Left: A bottle of special selection 4-puttonyos Tokaji aszu. The area where Tokaji wine is traditionally grown is a small plateau, 457 m (1500 ft) above sea level, near the Carpathian Mountains. The soil is of volcanic origin, with high concentrations of iron and lime. The location of the region has a unique climate, beneficial to this particular viniculture, due to the protection of the nearby mountains. Winters are bitterly cold and windy; spring tends to be cool and dry, and summers are noticeably hot. Usually, autumn brings rain early on, followed by an extended Indian summer, allowing a very long ripening period. Furmint accounts for 60% of the area and is by far the most important grape in the production of Hungarian wines. The Furmint grapes begin maturation with thick skins, but as they ripen the skins become thinner, and transparent. This allows the sun to penetrate the grape and evaporate much of the liquid inside, producing a higher concentration of sugar. Other types of grapes mature to the point of bursting, however, unlike most other grapes, Furmint will grow a second skin which seals it from rot. This also has the effect of concentrating the grape's natural sugars. The grapes are left on the vine long enough to develop the "noble rot" (Botrytis cinerea) mold. Grapes than are harvested, sometimes as late as December (and in the case of true Eszencia (one of the world's sweetest wines), occasionally into January). 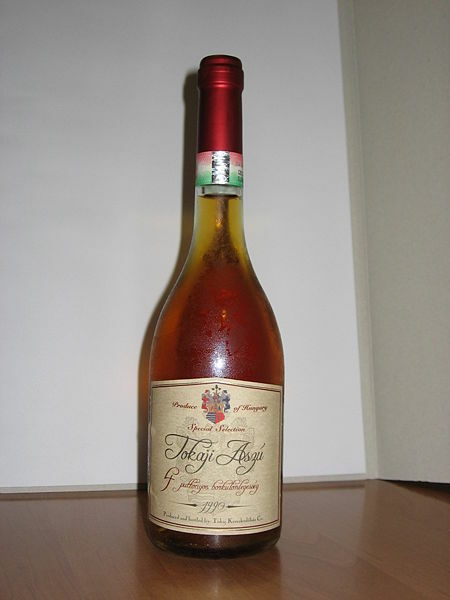 The world-famous variety of Tokaji wine is called Aszú. It is proudly cited in the Hungarian national anthem. It is the sweet, topaz-colored wine that is known throughout the English-speaking world as Tokay. Aszú berries are individually picked, then collected in huge vats and trampled into the consistency of paste (known as aszú dough). Must (freshly pressed grape juice that contains the skins, seeds, and stems of the fruitis) is poured on the aszú dough and left for 24–48 hours, stirred occasionally. The wine is racked off into wooden casks or vats where fermentation is completed and the aszú wine is to mature. The casks are stored in a cool environment, and are not tightly closed, so a slow fermentation process continues in the cask, usually for several years. Unlike most other wines, alcohol content of aszú typically runs higher than 14%. Annual production of aszú is less than one percent of the region's total output. The sweetest category of Aszú is called Eszencia. Also called nectar, this is often described as one of the most exclusive wines in the world, although technically it cannot even be called a wine because its enormous concentration of sugar means that its alcohol level never rises above 5-6 degrees. Eszencia is the juice of aszú berries which runs off naturally from the vats in which they are collected during harvesting. The sugar concentration of eszencia is typically between 500 g and 700 g per litre, although the year 2000 vintage produced eszencia exceeding 900 g per litre. Left: A bottle of Tokaji Eszencia. Eszencia is traditionally added to aszú wines, but may be allowed to ferment (a process that takes at least 4 years to complete) and then bottled pure. The resulting wine has a concentration and intensity of flavour that is unequalled, but is so sweet that it can only be drunk in small quantities. Storage of Eszencia is facilitated by the fact that, unlike virtually all other wines, it maintains its quality and drinkability for 200 years or more.